A sturdy shoehorn with a smooth finish which will not ladder stockings or snag socks. The 17" long one-piece shoehorn assists in easing-on footwear from either a standing or sitting position. 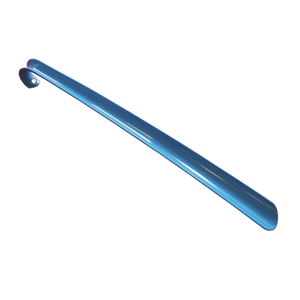 Blue Plastic Shoehorn... A sturdy shoehorn with a smooth finish which will not ladder stockings or snag socks. The 17" long one-piece shoehorn assists in easing-on footwear from either a standing or sitting position. The hooked handle has a hole for ease of use and storage. An essential everyday dressing aid for those experiencing mobility and bending difficulties.